This section demonstrates how to set up shared mounts on MGMT1 and MGMT2, and then install Cloudera Management Service to use those mounts on the primary and secondary servers. Important: Do not start the primary and secondary servers that are running Cloudera Management Service at the same time. Data corruption can result. Install packages cloudera-manager-daemons and cloudera-manager-agent packages using instructions from Installing Cloudera Manager, CDH, and Managed Services. Install the Oracle Java JDK version that is required for your deployment, if it is not already installed on the host. See CDH and Cloudera Manager Supported JDK Versions. Configure the agent to report its hostname as <MGMTHostname> to Cloudera Manager. This ensures that the connections from the Cloudera Manager Agents on the CDH cluster hosts report to the correct Cloudera Management Service host in the event of a failover. Note: The cloudera-scm user and the cloudera-scm group are the default owners as specified in Cloudera Management Service advanced configuration. If you alter these settings, or are using single-user mode, modify the above chown instructions to use the altered user or group name. Click Add Cloudera Management Service. Make sure you install all of the roles of the Cloudera Management Service on the host named MGMTHostname. Proceed through the steps to configure the roles of the service to use your database server, and use defaults for the storage directory for Host Monitor or Service Monitor. This test can fail in this way because of the way you modified /etc/hosts on MGMT1 and MGMT2 to allow the resolution of MGMTHostname locally. This test can be safely disabled on the MGMTHostname host from the Cloudera Manager Admin Console. If you are configuring Kerberos and TLS/SSL, see TLS and Kerberos Configuration for Cloudera Manager High Availability for configuration changes as part of this step. Install the cloudera-manager-daemons and cloudera-manager-agent packages using instructions from Installing Cloudera Manager, CDH, and Managed Services. Configure the agent to report its hostname as MGMTHostname to Cloudera Manager, as described previously in Installing the Primary. PING MGMTHostname (MGMT2 IP) 56(84) bytes of data. Log into the Cloudera Manager Admin Console in a web browser and start all Cloudera Management Service roles. This starts the Cloudera Management Service on MGMT2. 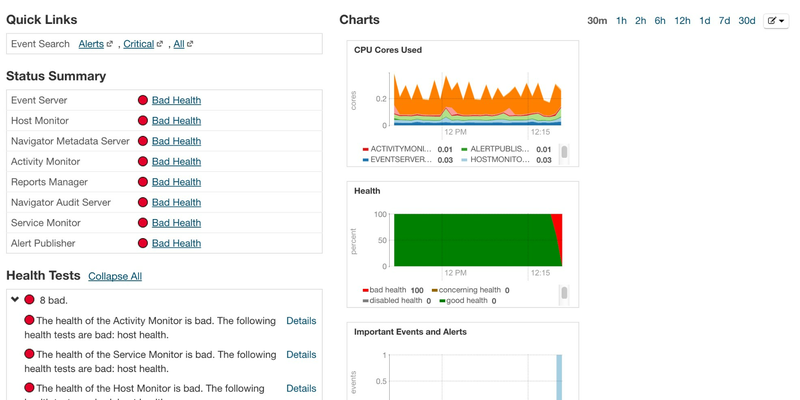 Wait for the Cloudera Manager Admin Console to report that the services have started. You should see ten total processes running on that host, including the eight Cloudera Management Service processes, a Cloudera Manager Agent process, and a Supervisor process. Test the secondary installation through the Cloudera Management Admin Console, and inspect the health of the Cloudera Management Service roles, before proceeding. Make sure that the UID and GID for the cloudera-scm user on the primary and secondary Cloudera Management Service hosts are same; this ensures that the correct permissions are available on the shared directories after failover.